Azure Naturals is a skincare company that provides high-quality facial skincare and anti-aging products using natural and organic ingredients whenever possible. 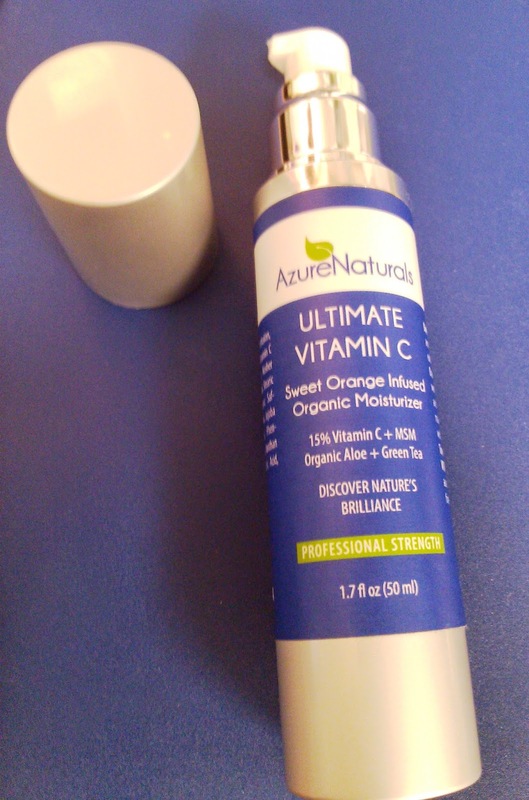 They offer a variety of products containing Vitamin C including the Ultimate Vitamin C Organic Moisturizer which contains 15% Vitamin C, Organic Aloe, Green Tea, and is infused with Sweet Orange Peel oil. It comes in a nice tube-like pump bottle and contains 1.7 ounces of cream. When I apply the moisturizer, it definitely smells like oranges and citrus! But it's not overwhelming or irritating in any way. It just leaves a nice light scent that reminds me of a sunny Florida afternoon. The white cream absorbs quickly and leaves my skin feeling really soft and like it has a velvety layer on it. I felt improvement in my skin texture right after the first use - much more smooth and silky than normal. It works really well on both face and neck/decollete area, and seemed to hydrate well. This moisturizer is especially helpful for the dark, uneven spots I experience with my olive skin since Vitamin C helps fade age spots and discoloration. I feel like my skin is more even and toned, and it looks like the spots are fading. Vitamin C also works as an antioxidant to heal and prevent sun damage. Overall, this product improves my skin texture and tone, and is made of natural, plant-based ingredients so I can feel confident about what I'm putting on my skin.